Bad news for Facebook from Germany today. 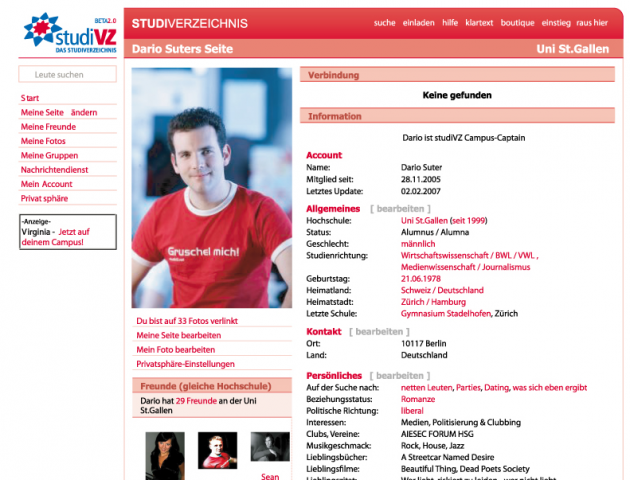 Facebook has had issues with Berlin-based social network StudiVZ (“student directory” in German) for years before deciding last summer to finally sue their German clone in the US. In November, Facebook filed another suit [PDF], this time in Germany. The allegation in both cases: Intellectual property theft, with Facebook saying StudiVZ infringes on their site’s design, features and services. In addition, StudiVZ is accused of having stolen PHP source code from Facebook. Anyone who spends more than 2 minutes on StudiVZ must come to the conclusion that the site is a total knock-off of the American original. It’s even rumored that several lines of very early StudiVZ code contained the word “Fakebook” and as a German, I can say StudiVZ is more or less a translated duplicate. But today the County Court in Cologne (where the suit was filed in November) decided against Facebook. And the judges were pretty harsh in their verdict. The court argues that it can’t identify any unfair practices, mainly due to the fact that StudiVZ isn’t trying to trick users into thinking they are actually on Facebook. Another factor in favor of the German site: When StudiVZ went live in Germany in November 2005, Facebook was virtually unknown in that country. The court says this changed only in March last year when Facebook started specifically targeting German users. And as if that’s not enough, the court criticized Facebook’s lawyers for being too sloppy, saying they made too many unfounded guesses instead of presenting hard facts that prove StudiVZ stole source code. As a consequence, the judges refrained from getting the opinion of independent experts who could have looked into this specific allegation. However, it was acknowledged in court that StudiVZ and Facebook “obviously share some similar and identical elements”. It’s still open if Facebook will appeal the ruling (a Facebook spokeswoman said her company would now review all legal options). The lawsuit against StudiVZ in the US is still on. And Facebook might want to boost their efforts to at least win that one since winning in Germany means winning in Europe’s biggest web market, where the StudiVZ network is a big player: A total of 12.9 million people from German-speaking countries are registered at StudiVZ itself (mainly for university students) and its spin-offs schuelerVZ (for high-school students) and meinVZ (for everybody else). Facebook has about 2 million users in Germany.